Easter Eggs: Pagan or Not? In many cultures, the egg is viewed as the symbol of new life. It is, after all, the perfect example of fertility and the cycle of rebirth. In early Christian cultures, consumption of the Easter egg may have marked the end of Lent. In Greek Orthodox Christianity, there is a legend that after Christ's death on the cross, Mary Magdalene went to the emperor of Rome, and told him of Jesus' resurrection. The emperor's response was along the lines of "Oh, yeah, right, and those eggs over there are red, too." Suddenly, the bowl of eggs turned red, and Mary Magdalene joyfully began preaching Christianity to the emperor. Mary Magdalene and the red eggs aren't the earliest examples of eggs as a spring symbol. In Persia, eggs have been painted for thousands of years as part of the spring celebration of No Ruz, which is the Zoroastrian new year. In Iran, the colored eggs are placed on the dinner table at No Ruz, and a mother eats one cooked egg for each child she has. The festival of No Ruz predates the reign of Cyrus the Great, whose rule (580–529 b.c.e.) marks the beginning of Persian history. A Chinese folk tale tells of the story of the formation of the universe. Like so many things, it began as an egg. A deity named Pan Gu formed inside the egg, and then in his efforts to get out, cracked it into two halves. The upper portion became the sky and cosmos, and the lower half became the earth and sea. As Pan Gu grew bigger and more powerful, the gap between earth and sky increased, and soon they were separated forever. Pysanka eggs are a popular item in the Ukraine. 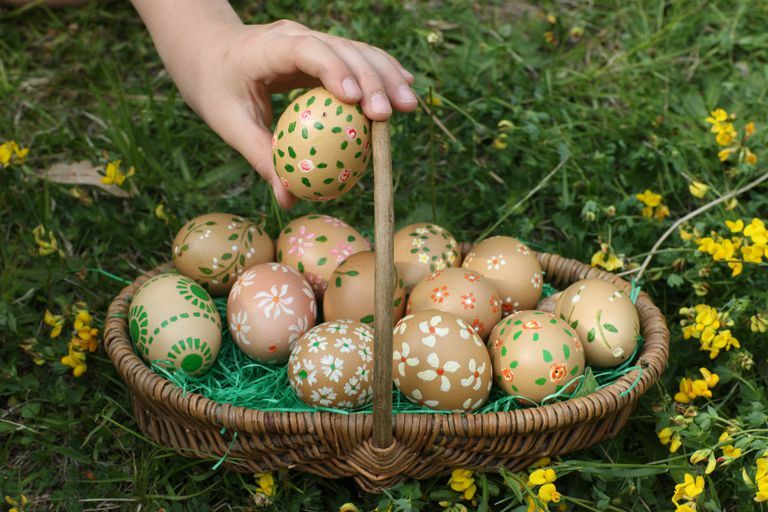 This tradition stems from a pre-Christian custom in which eggs were covered in wax and decorated in honor of the sun god Dazhboh. He was celebrated during the spring season, and associated with birds. People were unable to catch birds, as they were the god's chosen animals, but they could collect the eggs, which were considered magical things indeed. There are some claims that the original Easter eggs are Pagan symbols from Europe, but there's little evidence to support this. Instead, it seems to be a more middle eastern tradition. However, in Europe there may have been a goddess called Eostre, whose name gives us both Ostara and Easter. The Venerable Bede describes Eostre as a goddess with fertility associations, which loosely connects her to both rabbits and eggs. Author Jacob Grimm, of Grimm's fairy tales, suggested that eggs were a symbol of early European Paganism. In some early cultures, the nocturnal hare was actually considered a symbol of the moon. In addition to feeding at night, the hare's gestation period is approximately 28 days, which is the same length as a full lunar cycle. In European folklore, the rabbit connection to eggs is one based on confusion. In the wild, hares birth their young in what is known as a form–basically, a nest for bunnies. When the hares abandoned a form, it was sometimes taken over by plovers, who would then lay their eggs in it. The locals would then find eggs in the hare's form. The character of the "Easter bunny" first appeared in 16th-century German writings, which said that if well-behaved children built a nest out of their caps or bonnets, they would be rewarded with colored eggs. This legend became part of American folklore in the 18th century, when and influx of Germans emigrated to the U.S.
"The Easter bunny first arrived in America in the 1700s with German immigrants who settled in Pennsylvania and transported their tradition of an egg-laying hare called Osterhase or Oschter Haws. Their children made nests in which this creature could lay its colored eggs. Eventually, the custom spread across the U.S. and the fabled rabbit’s Easter morning deliveries expanded to include chocolate and other types of candy and gifts, while decorated baskets replaced nests. Additionally, children often left out carrots for the bunny in case he got hungry from all his hopping." Today, the Easter business is a huge commercial venture. Americans spend nearly $1.2 billion a year on Easter candy, and another $500 million on Easter decorations each year. What Do Pagans Believe About the Creation of the World? Try One of Our Free About Paganism Study Guides!